Santiago Zabala is ICREA Research Professor of Philosophy at the University of Barcelona. He is the author of The Hermeneutic Nature of Analytic Philosophy (2008), The Remains of Being (2009), Hermeneutic Communism (2011, coauthored with G. Vattimo), editor of Weakening Philosophy (2007), The Future of Religion (2005), Nihilism and Emancipation (2004), Art's Claim to Truth (2009), and co-editor with Jeff Malpas of Consequences of Hermeneutics (2010). Zabala also writes opinion articles and reviews for the New York Times, Al Jazeera, El Pais and other international journals. 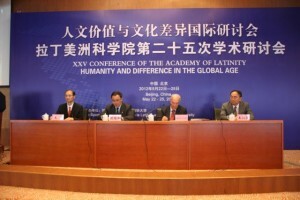 Santiago Zabala reports from the Beijing conference of the Academy of Latinity. In a global era when humanity seems to have lost its self-esteem, Zabala writes, the call for a new humanism capable of facing existential annihilation is not only necessary but also urgent.